Great wine is often best paired with life’s big moments, and a Buena Vista bottle actually serves both requirements – effortlessly. Last night we pulled the cork on the 2012 Geza’s Selection Pinot Noir from Sonoma County’s Buena Vista Historic Winery in order to celebrate finding a new home for our family. We’re finishing it tonight, and before reading any further you should know this wine is simply amazing. 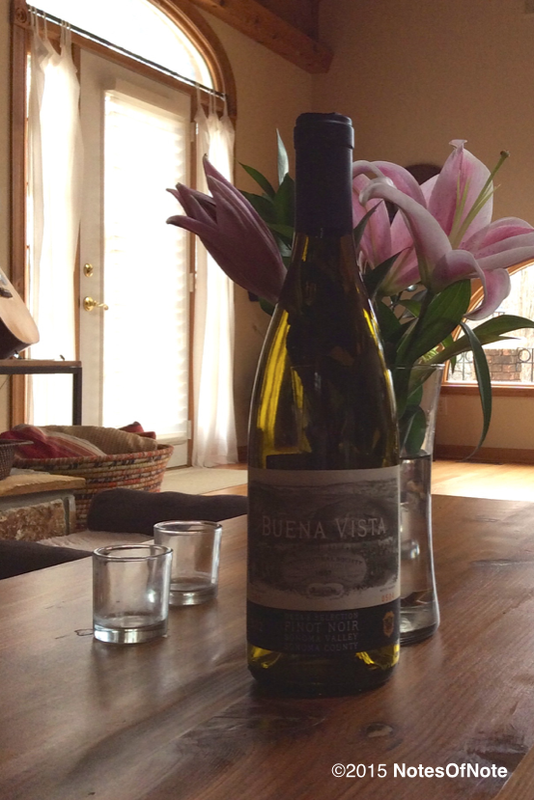 2012 Geza’s Selection Pinot Noir, Buena Vista Historic Winery, Sonoma County, California, USA. Our accompanying meals, coincidentally, didn’t stray far from those recommendations. We had the 2012 Geza’s Selection with grilled steaks and with pork chops, and the wine was spot on in both instances. There is virtually no acidity, no lasting tannin finish, and only ample smiles resulting from tasting Geza’s Selection. If we had opened this on a weekend it wouldn’t have lasted overnight! We received the Geza with our November 2014 Count’s Club shipment, but you can get your own through the Buena Vista website if you’re not able to drive to that beautiful vineyard. There are only 300 cases of the Geza’s Selection for this vintage, however, so don’t too long to make up your mind and do the right thing. We had bottle number 0504 so you’ll have to choose another ;). This entry was posted in Uncategorized and tagged Buena Vista, Buena Vista Winery, California, california winemaking, Sonoma, USA.